I just realized something quite shocking. My blog’s been around for all of two weeks and I haven’t posted anything with sprinkles yet! Must fix this problem immediately. Sprinkles are really magical. I realized a few months back that if I put sprinkles on anything, my kids will eat it. While I’m tempted to test that theory on broccoli, that’s sort of gross. But my son, who pretends to hate chocolate, decided to eat these bars just because of the sprinkles. Which is appropriate, considering these are magic bars. The traditional magic bar has a graham cracker crust and then layers of goodness, like chocolate chips and nuts, finished off with a layer of condensed milk. 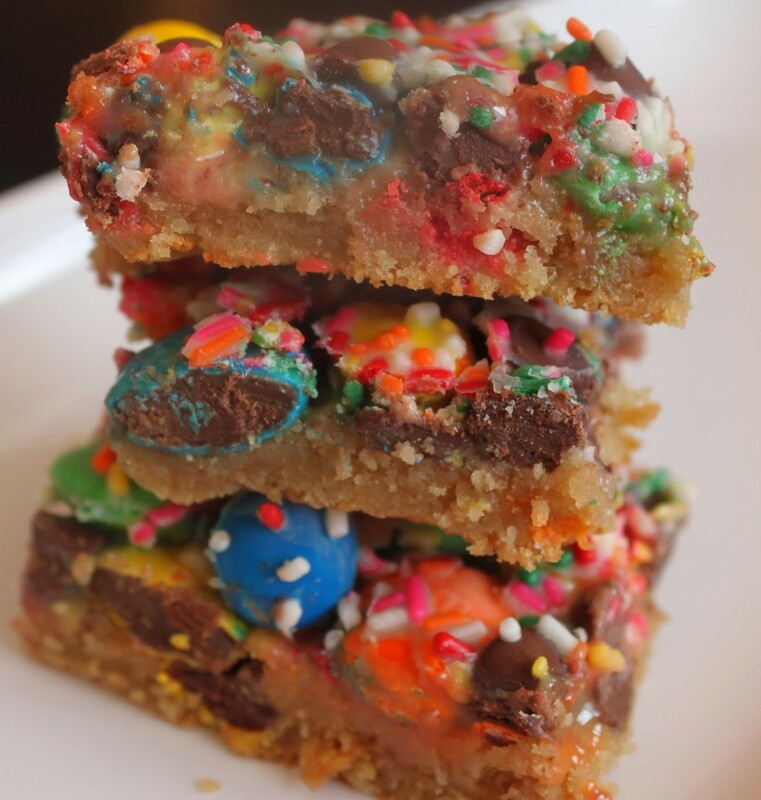 While I don’t always like to mess with success, I’ve found that magic bars can be created in any flavor, anytime, which is why you will probably see a lot of them on this site. For these bars, a few elements collided to get my thinking cap going. First of all, I’m a teacher, and I sometimes order fundraiser food from my students. One of my students was selling cookie dough, so a couple of months back I bought a batch of the M & M variety. It happened to arrive this week. On that very day, I was in CVS replenishing my supply of Reese’s peanut butter eggs. They’re really the best, but that’s a different post for another day. As I was nearing the candy aisle, I spied something totally unexpected nestled among the bags: birthday cake-flavored M & Ms. I was dumbfounded. These exist? An idea was born in that moment. 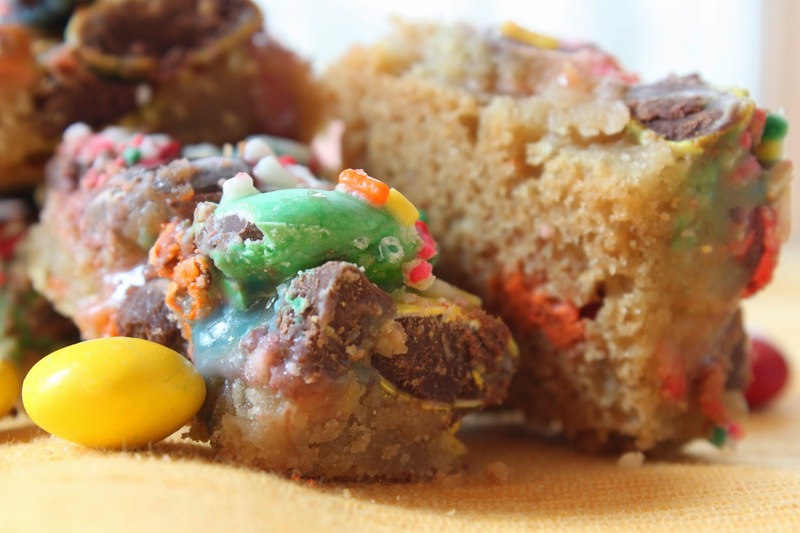 An M & M cookie crust, followed by M & Ms (I used the birthday cake and mega varieties), milk chocolate chips, condensed milk, and…wait for it…sprinkles! 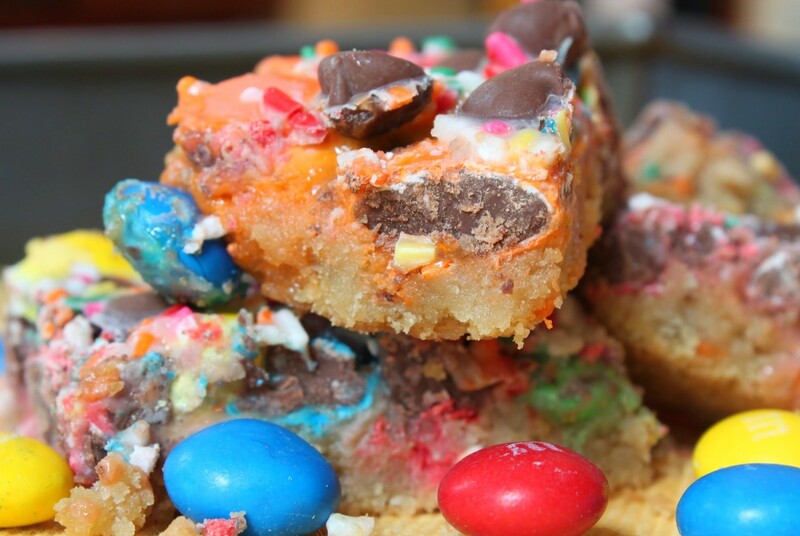 Voila, birthday cake magic bars! With M & Ms. Sorry, I’m just so excited. It’s hard to contain myself. Okay, on to practical concerns. 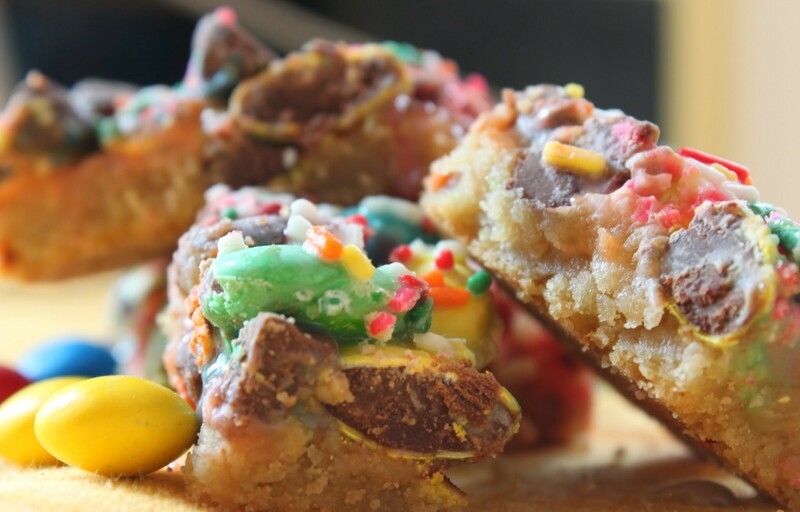 If you don’t have access to M & M cookie dough and don’t feel like doing it from scratch, you can use chocolate chip cookie dough instead and mix in some mini M & Ms by hand. Not all of us have high school students selling us fundraiser products. As for the toppings, feel free to play around. 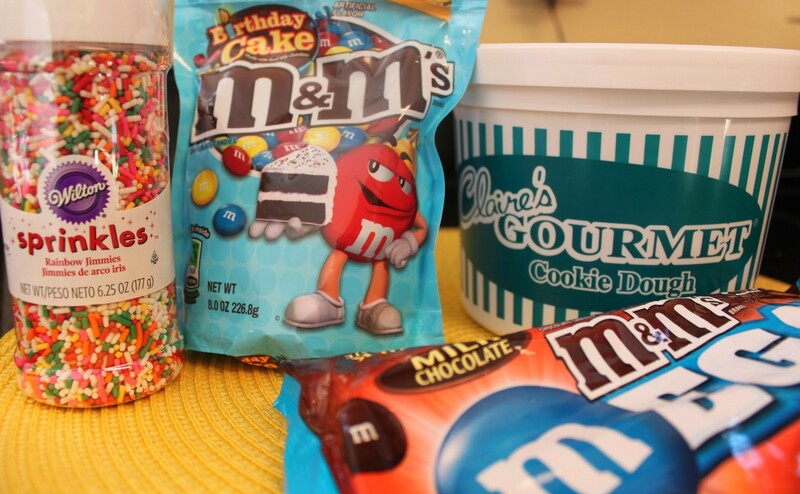 Use different flavors of M & Ms if you like. But don’t forget the sprinkles! No child on this planet will forgive you if you decide to go without. It’s just not cool. Here’s how to bribe every kid (and who am I kidding, adult too) in a 17-mile radius. Preheat the oven to 350. Spray a 9 x 13 pan with cooking spray. 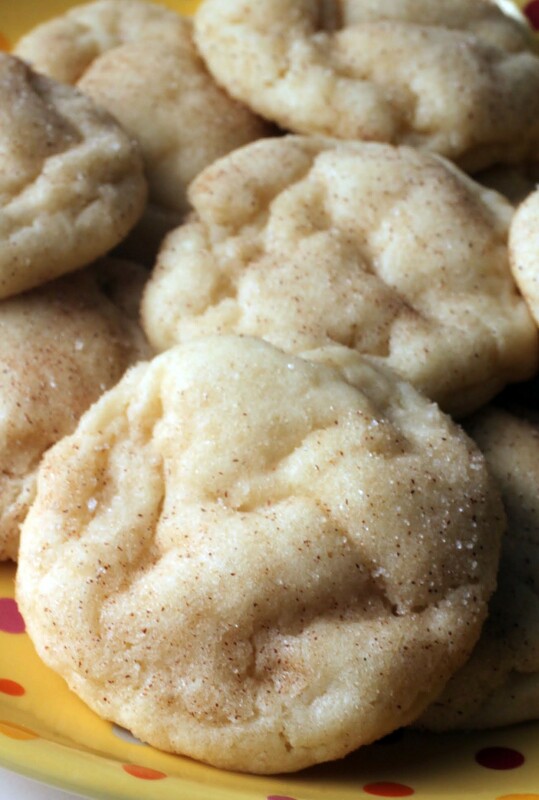 Take the prepared cookie dough out of the refrigerator and bring it to room temperature. When it’s soft enough to work with, press the dough into the bottom of the pan, making sure the layer is even. 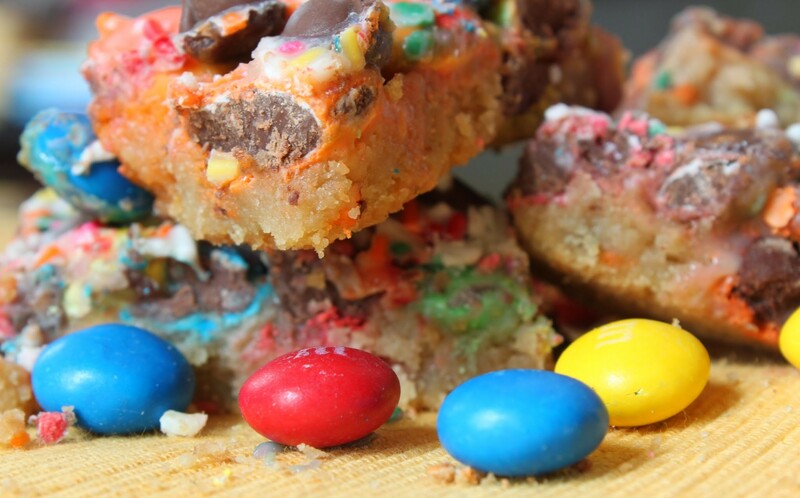 Note: if you’re using chocolate chip cookie dough, you can opt to mix the mini M & Ms into the dough. Bake the bottom layer for 15 minutes. Remove it from the oven and let it cool slightly, about 10 minutes. Taking care to cover the entire surface evenly, sprinkle on the birthday cake and Mega M & Ms, followed by the chocolate chips. Pour the condensed milk over the top, making sure that the entire pan is covered. Finally, shake on the rainbow sprinkles liberally, again being sure to get maximum coverage. Put the bars back in the oven for 15-20 minutes until the edges are golden brown and the middle is set. Allow to cool. 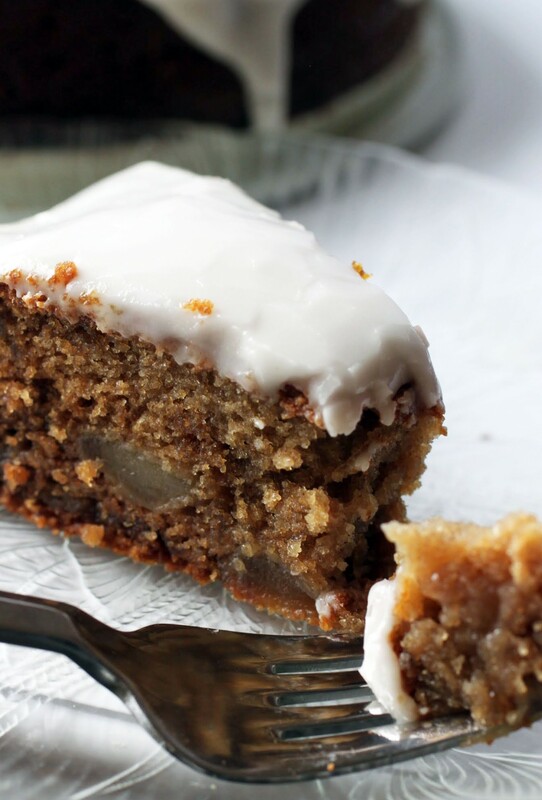 Cut into squares and enjoy! Have you ever met anyone who doesn’t love a chocolate chip cookie? If you have, you can inform them that they are missing a soul. I’m sorry, I know taste is subjective. But I mean, come on. It’s a chocolate chip cookie! When you’re feeling lazy, make bars instead. 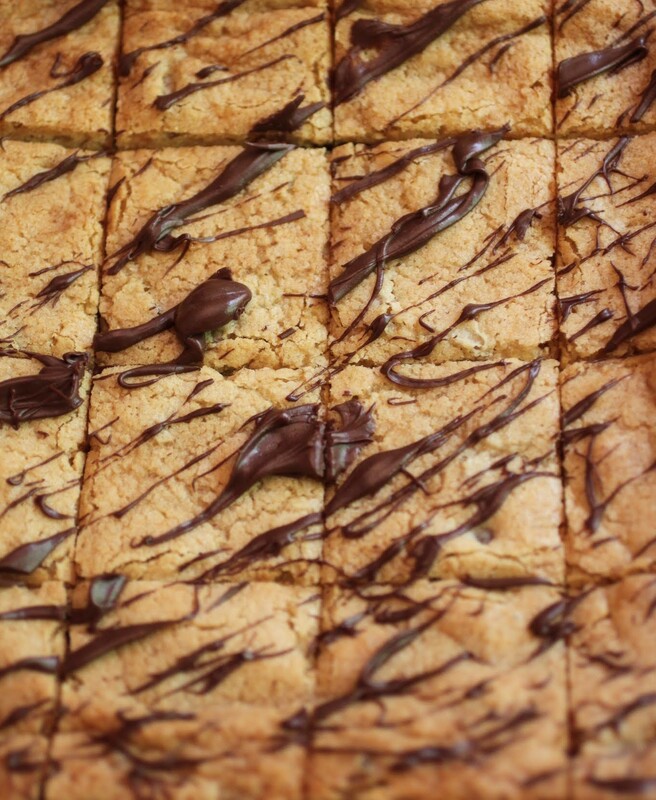 These chocolate chip bars are also full of chopped pecans and topped off with chocolate drizzle. The flair on top is optional, but I love me some drizzle.